[Source: AnimeNewsNetwork] Annecy-winning director Keiichi Hara ( Summer Days with Coo , Colorful ) directed the film based on Hinako Sugiura 's acclaimed historical manga Sarusuberi . The film originally premiered in Japan in May 2015. The place: Edo, now known as Tokyo. One of the highest populated cities in the world, teeming with peasants, samurai, townsmen, merchants, nobles, artists, courtesans, and perhaps even supernatural things. 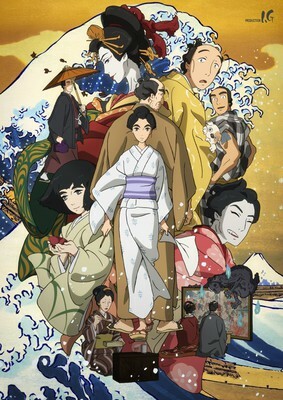 Miss Hokusai previously won: the Jury Award in the Official Feature Film Competition at the 39th Annecy International Film Festival in June 2015; the Sequences Award for best Asian feature film, the Satoshi Kon Award for best animated feature film, and the Gold Audience Award for best animated feature film at the 19th annual Fantasia International Film Festival in August 2015; the Best Animated Feature Film award at the 48th annual Sitges International Fantastic Film Festival in October 2015; Best Animated Feature Award at the Asian Pacific Screen Awards in November 2015; and Best Animation Film Award at the Mainichi Film Awards in January.